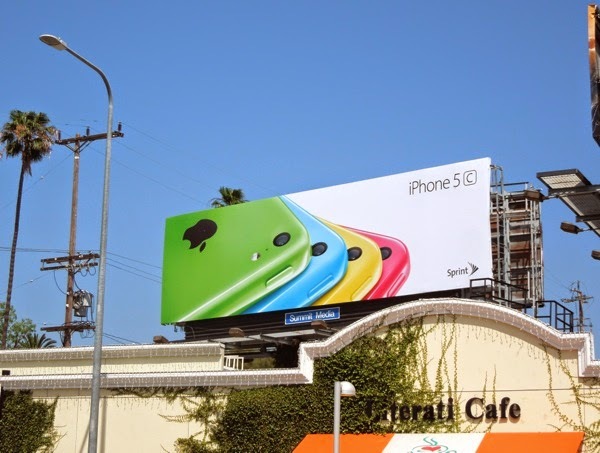 You knew it was coming, after two waves of the new iPhone 5c billboards, first on the same colour and then different colour backgrounds, the smartphone is back in the skies of L.A. with a fresh new ad campaign on Apple's instantly recognisable white background. 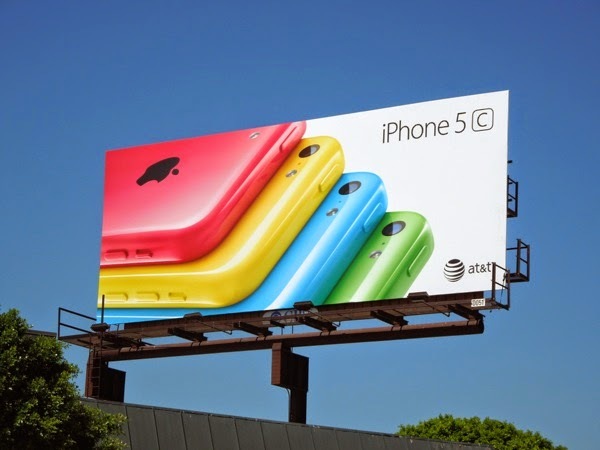 This new cheaper model of the iPhone 5 has been hailed by some critics as a failure, but units of the colourful plastic-backed phones have still managed to outsell the likes of every Blackberry, Windows Phone and Android smartphone, hands done. 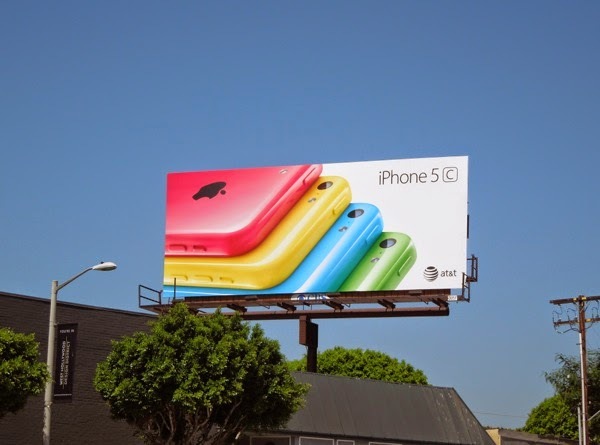 There are also some people who don't particularly like the choice of colours for the 5c or the first waves of ad campaigns, which some considered ugly. 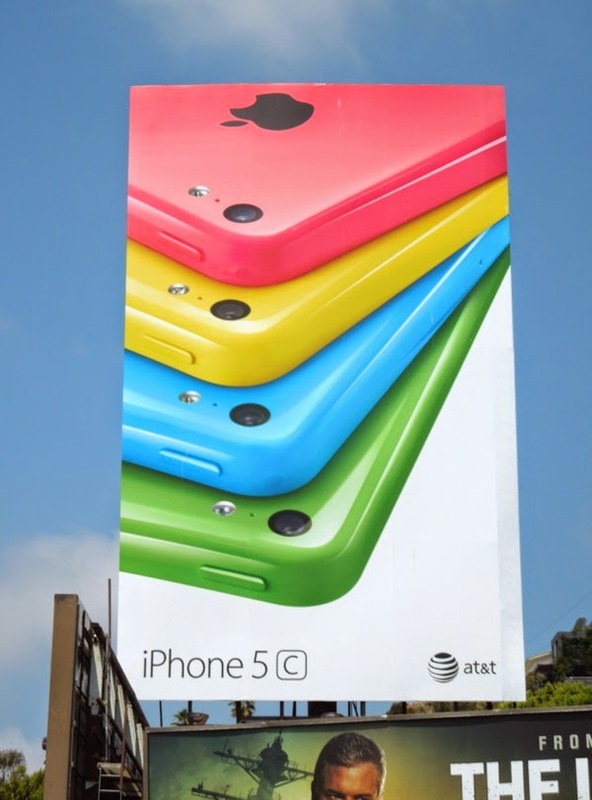 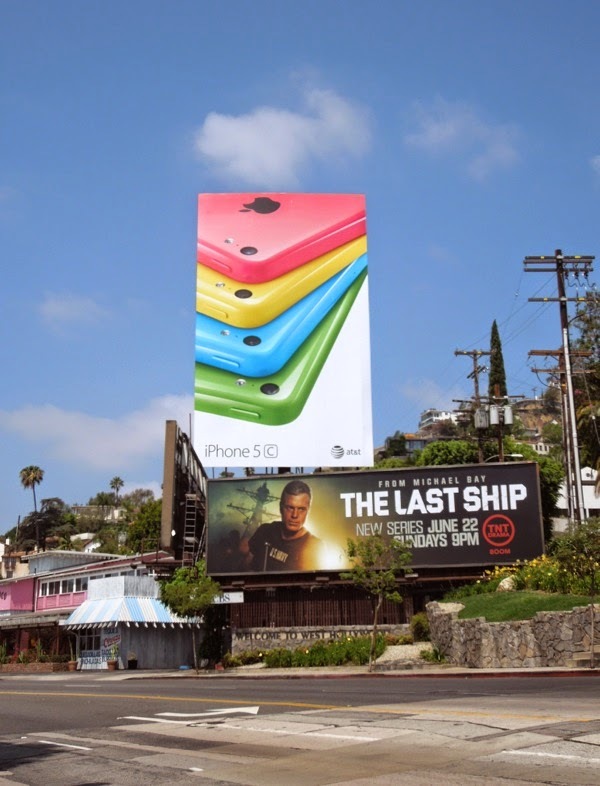 What did you think, take a look for yourself at the launch outdoor ad campaign for Apple's iPhone 5c and the second wave multi-coloured iPhone 5c billboards. 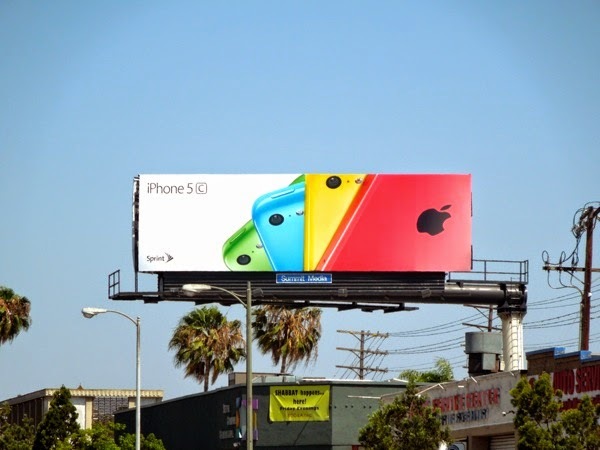 Daily Billboard liked each preceding campaign, as they were a breath of fresh air for the tech giant with their burst of colour, and thinks this new installment is a natural progression, which wouldn't have looks as impactful if Apple had started with these versions. 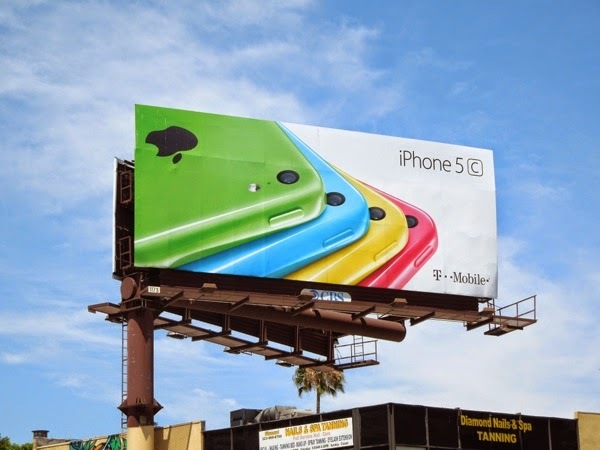 Another difference with these billboards, which feature a fan effect of the pink, green, blue and yellow phones (with the white version being absent again), is that they also sport the logos of the various service providers, from Sprint to AT&T and Verizon, which you don't usually see Apple do on their ads. 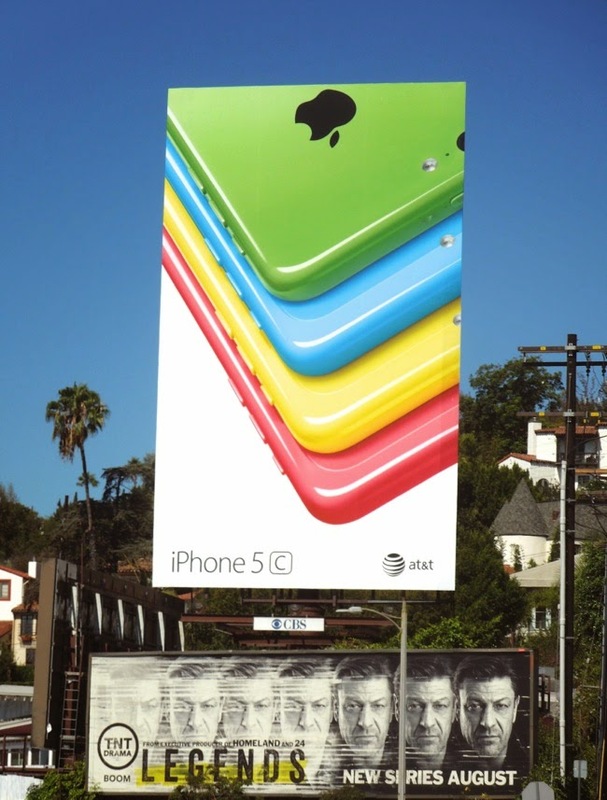 This third wave of creatives were photographed around the streets of L.A. on May 25, 2014, from Sunset Boulevard to Melrose Avenue, Wilshire Boulevard to Pico Boulevard, La Cienega Boulevard to Santa Monica Boulevard and Beverly Boulevard. 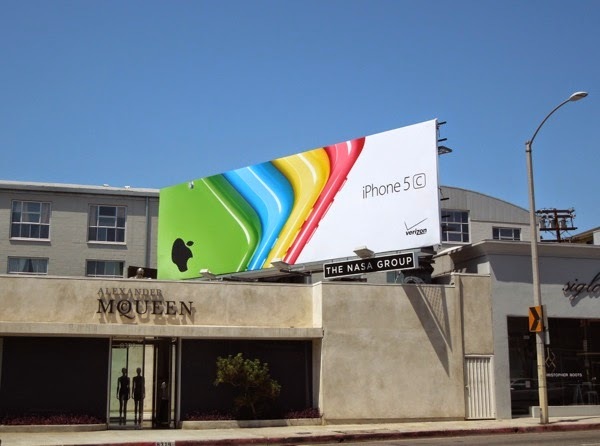 Apple certainly doesn't scrimp on its outdoor advertising budget, that's for sure. 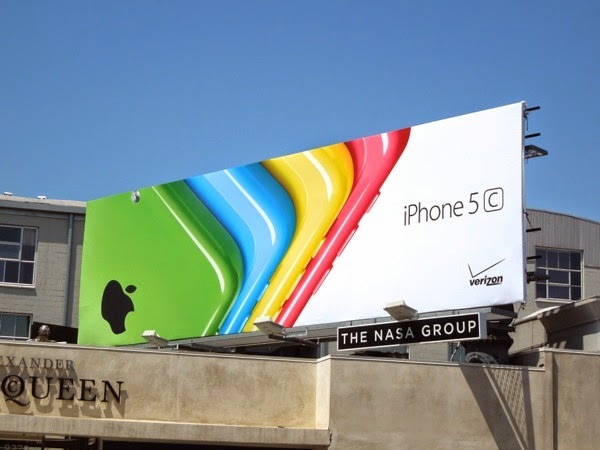 Now with the iPhone 6 on the horizon, will this be the last campaign we see for the iPhone 5c, or do you think there's one more iteration still to come. 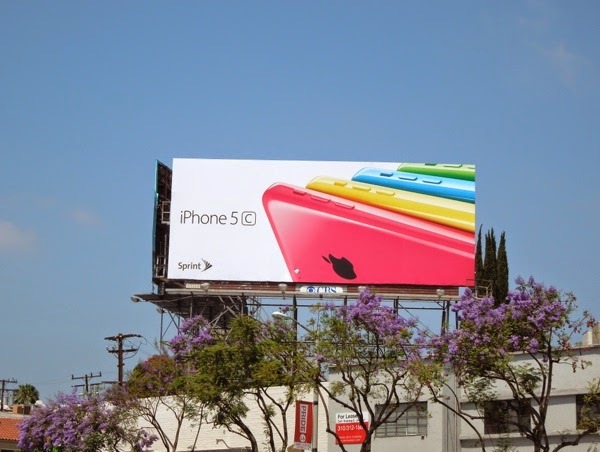 UPDATED: Not to be left out, here's another creative featuring the T-Mobile logo spotted at the corner of Hollywood Boulevard and La Brea Avenue on June 4, 2014. 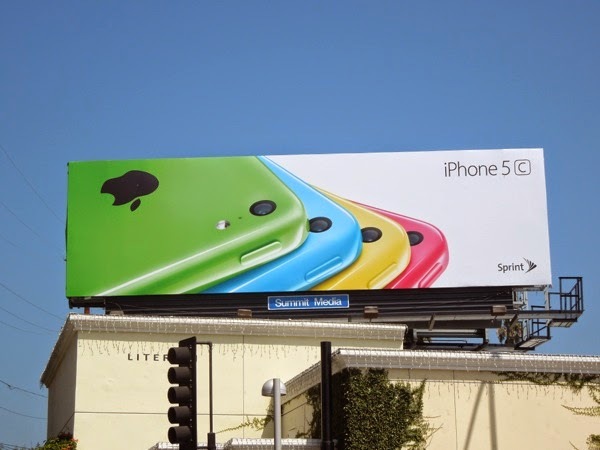 UPDATED: Two months later and it's time to refresh this multi-coloured fan effect campaign with another wave of creatives. 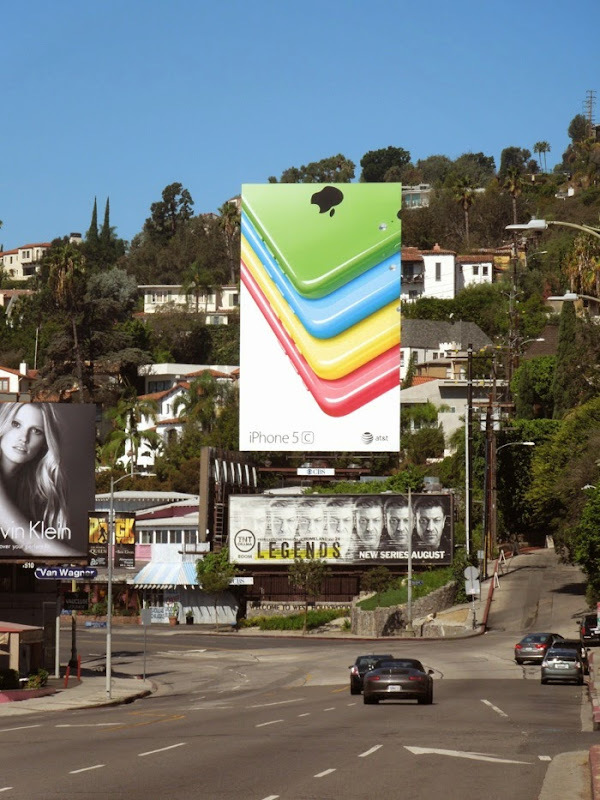 This new giant-sized billboard in Apple's regular ad location beside the Chateau Marmont Hotel along West Hollywood's Sunset Boulevard was snapped on August 5, 2014. 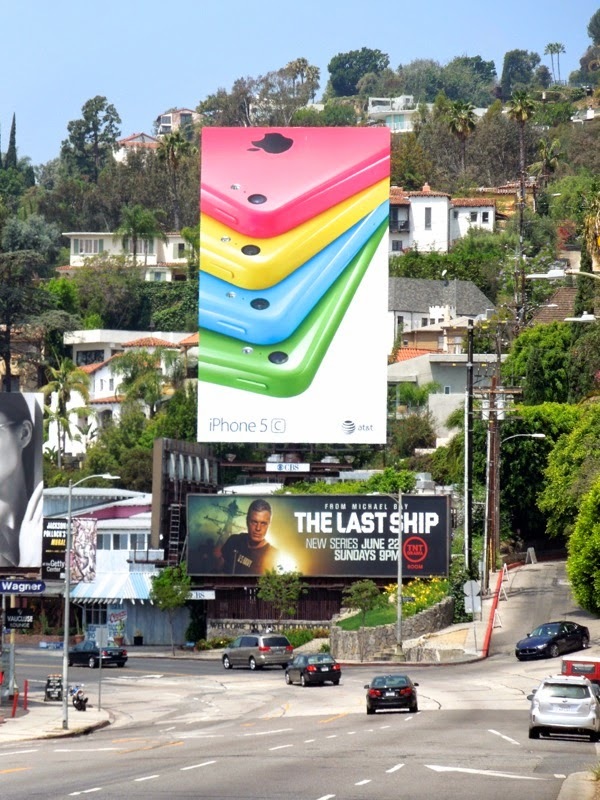 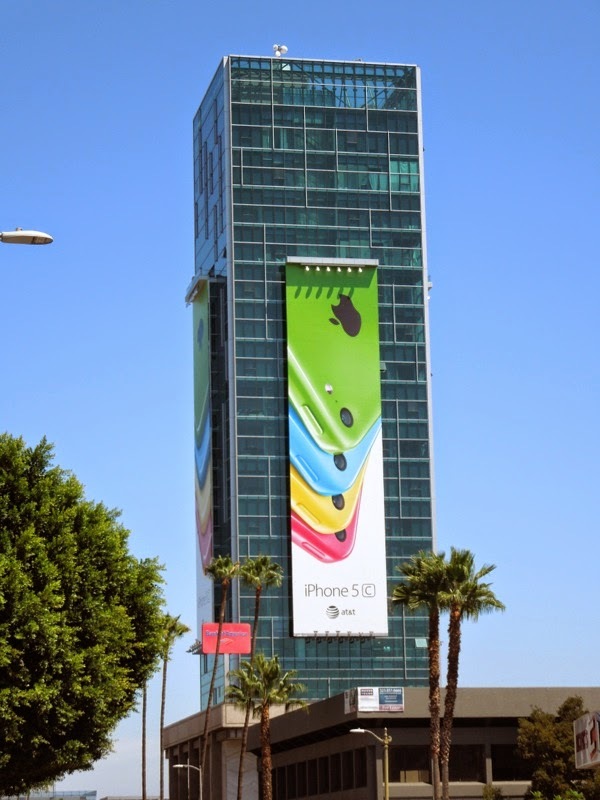 Plus it looks like Apple has taken over Sunset Vine Tower again for the iPhone 5c, with super-sized vertical ads like this snapped on August 21, 2014. 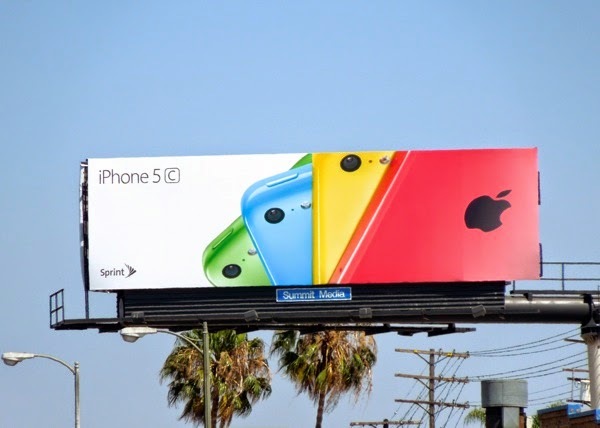 And it's interesting to note that red, yellow, blue, and green, in that order, are the middle part of the Google logo. 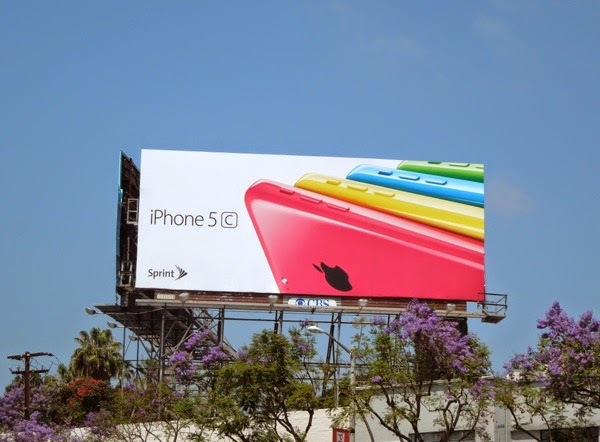 Thanks for sharing Peter, although the red is actually a pink phone.